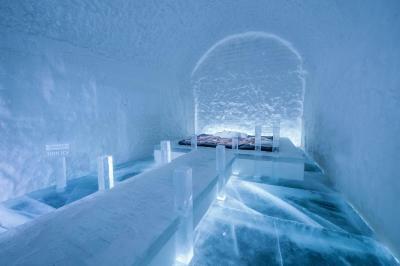 Lock in a great price for Icehotel – rated 8.8 by recent guests! Life time experience. 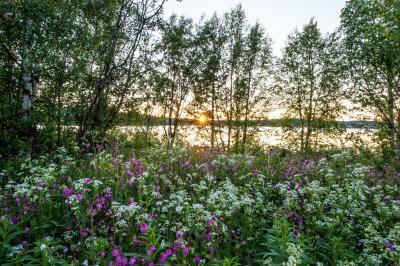 Awesome location right on the banks of Thorne river. Very good selection for breakfast. The warm rooms were very comfortable and cozy. 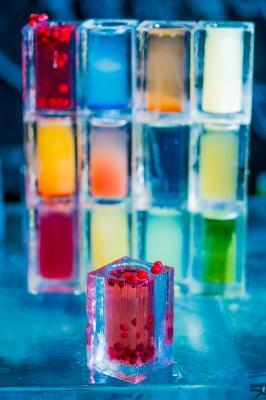 The ice sculptures and art work were awesome. I went for my 40th birthday with 5 friends and this was one of the highlights of the trip!!!! Wonderful experience. Once in a lifetime trip to add to your bucket list! The hotel was incredibly beautiful. It will be something I remember for the rest of my life. They do their best to keep you warm and comfortable through the night. Unique experience. Must try. Staffs were friendly and always eager to help. The hotel also provide overalls which guests could borrow as needed. Their overalls will keep you very warm even if the temperature is -7 or -8 degree Celsius. Awesome experience/tour through the IceHotlee365 & production facility (the annual IceHotel hadnt been built yet). Had a very early morning flight and wouldnt have been able to have the provided breakfast but they packed me a togo breakfast. 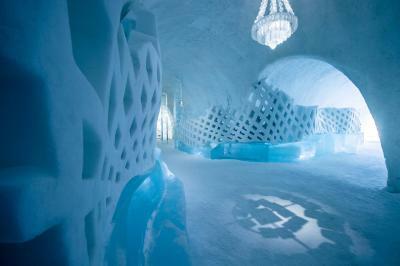 You can go into the IceHotel and see all the amazing sculptures in the different rooms. The staff are super friendly and very helpful. 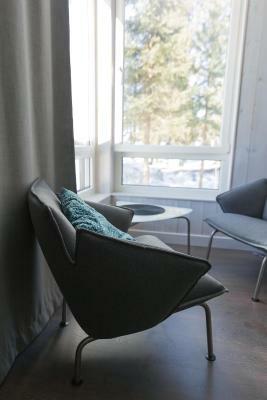 We stayed in a warm room, which was clean, cozy and had a great view of the lake. I had a fantastic reindeer stew at the restaurant for dinner and there was a great selection for breakfast the next day. I loved the property location. 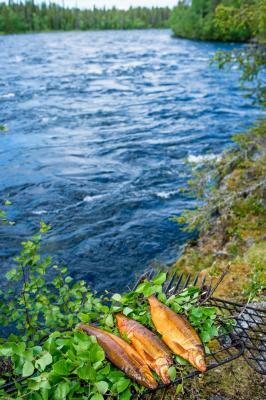 Right next to the river torne. I loved the cleanliness and awesome rooms. The facilities were beautiful. The sculptures were amazing! Icehotel This rating is a reflection of how the property compares to the industry standard when it comes to price, facilities and services available. It's based on a self-evaluation by the property. Use this rating to help choose your stay! 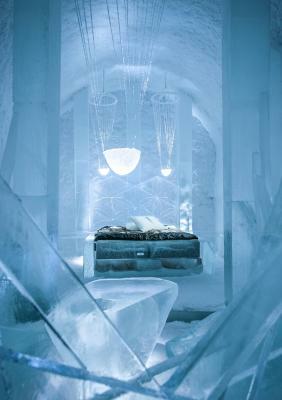 Located in Jukkasjärvi in northern Sweden, the Icehotel features rooms entirely made out of sculptured ice from the neighboring Torne River. Warm rooms are also offered. 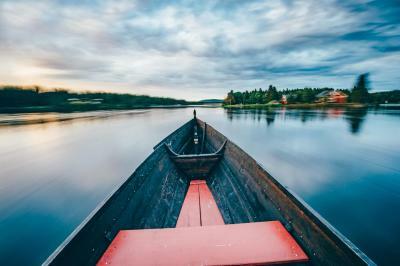 A bookable sauna experience featuring a sauna, wood-burning hot tub and ice bath is available for a fee. 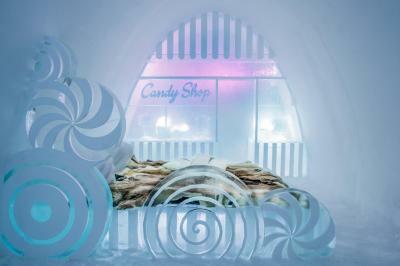 Holding a temperature between -5 to -8 degrees Celsius, the individually themed cold rooms include hand-carved ice furnishings by international artists. 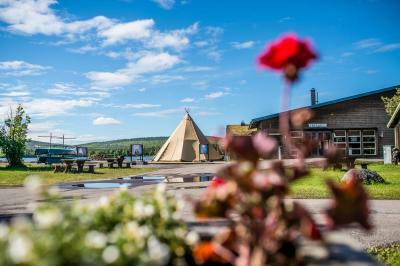 Guests sleep in thermal sleeping bags on exclusive Carpe Diem beds covered in reindeer hides. 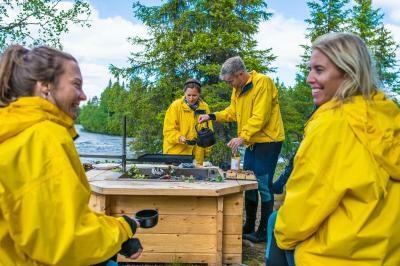 In the morning, guests can enjoy the shared sauna. All warm rooms feature a flat-screen TV with cable channels, dining area, and a private bathroom equipped with a shower. Free WiFi is offered in all rooms. 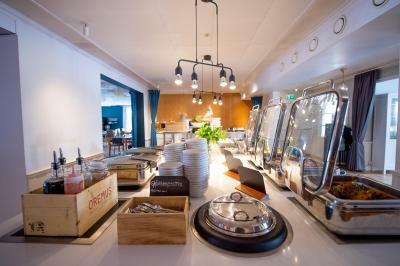 The on-site Icehotel restaurant serves traditional dishes with locally produced ingredients. 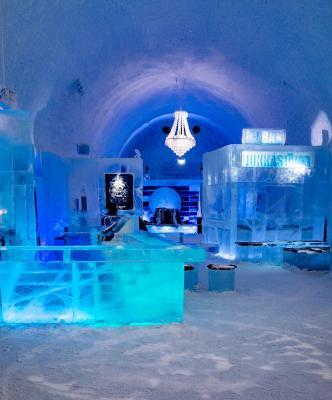 Guests can relax with hot drinks and snacks in the warm lounge, or enjoy cocktails served in glasses made out of ice in the below-freezing Icebar. 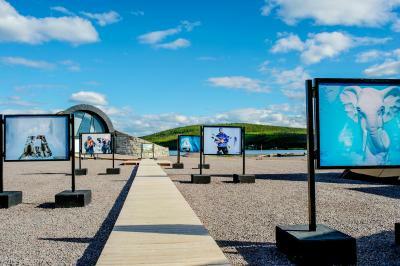 Guests can enjoy a free 30-minute guided tour, offered daily in both English or Swedish, of the cold Ice Hotel. The area around Icehotel is popular for outdoor winter activities such as dog sledding, reindeer sled excursions, and snowmobile tours. 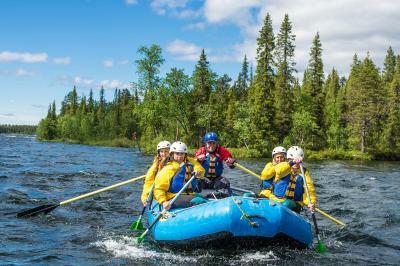 The staff will also be happy to arrange activities such as river rafting, hiking, and fishing. 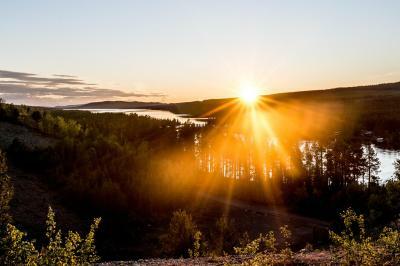 During summer season, guests will experience midnight sun. 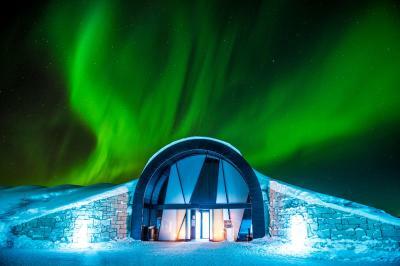 In the winter, guests can enjoy northern lights if lucky. 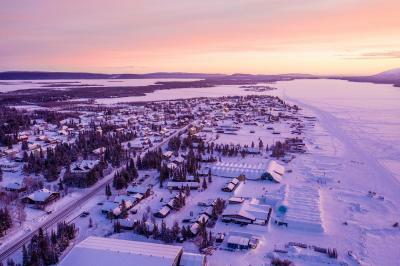 The closest airport is Kiruna Airport, 8.7 mi from the property. Bookable shuttle service is available upon request for a fee. 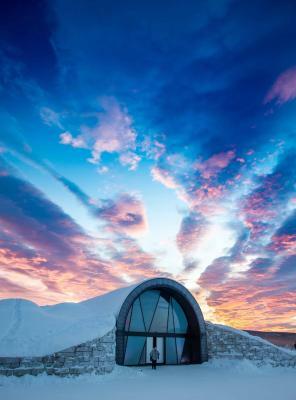 When would you like to stay at Icehotel? This bright two-bedroom chalet with Scandinavian décor includes a kitchenette, seating area and private bathroom equipped with a shower and hairdryer. Guests can enjoy the flat-screen TV. 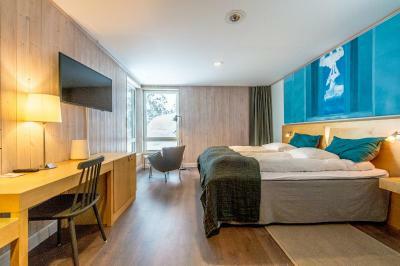 This wood-paneled two-bedroom chalet with Scandinavian décor includes a kitchenette, seating area and private bathroom equipped with a shower and hairdryer. The master bedroom includes a luxurious Carpe Diem bed. Guests can enjoy the flat-screen TV. Located on the ground floor, this bright and wood-paneled double or twin room features a desk, seating area and flat-screen TV. The private bathroom has underfloor heating and is equipped with a shower and hairdryer. 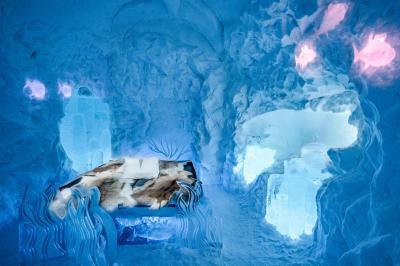 Available year-round, these suites are completely made out of hand-carved ice and individually themed. 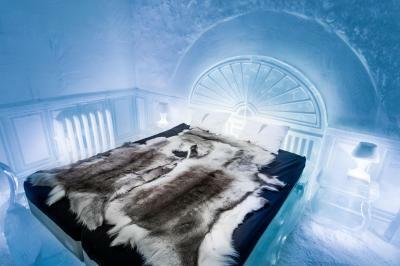 Guests sleep on luxurious Carpe Diem beds covered with reindeer hide. Thermal sleeping bags are offered. Bathroom facilities are located in a heated neighboring building. There is no space for extra beds. 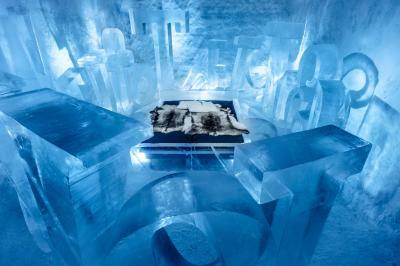 This unique suite is completely made out of hand-carved ice and is part of the concept Icehotel 365, available year-round. Guests sleep on luxurious Carpe Diem beds covered with reindeer hide. Thermal sleeping bags are included. The suite features a private, heated private bathroom including a sauna, bath and storage for guests' luggage. 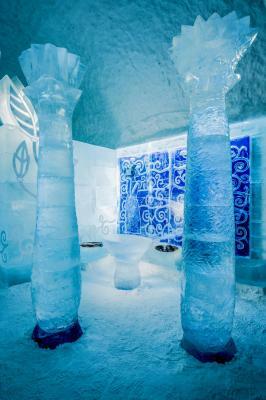 These individually themed suites feature hand-carved ice design and sculptures. Guests sleep on a thick mattress resting on a wooden base, and is covered with reindeer hides. Thermal sleeping bags are included. Instead of doors, the room has curtains for privacy. Bathroom facilities are located in a heated neighboring building. Luggage is stored in a luggage storage room prior to the overnight stay. 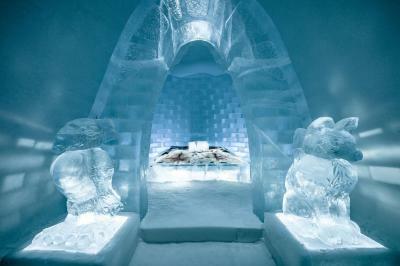 This room features ice décor and a bed made of ice. 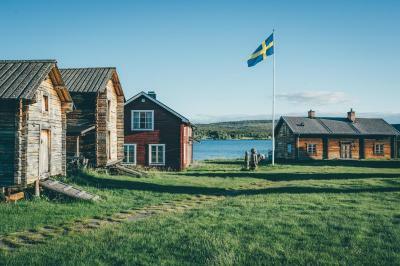 Guests sleep on a thick mattress resting on a wooden base, and is covered with reindeer hides. Thermal sleeping bags are included. Instead of doors, the room has curtains for privacy. This superior hotel rooms are spacious and comfortable with selected, natural materials complemented by organic shades of white, gray and brown. Each superior room has its own individual artwork above the bed features a desk, seating area and flat-screen TV. The private bathroom has underfloor heating and is equipped with a shower and hairdryer. All rooms are ground floor level. 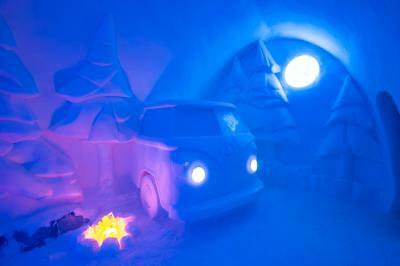 House Rules Icehotel takes special requests – add in the next step! 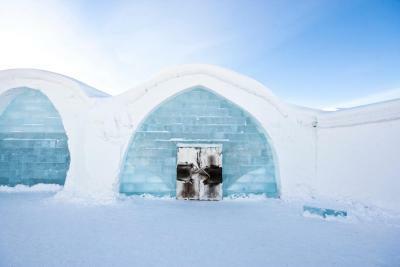 Icehotel accepts these cards and reserves the right to temporarily hold an amount prior to arrival. 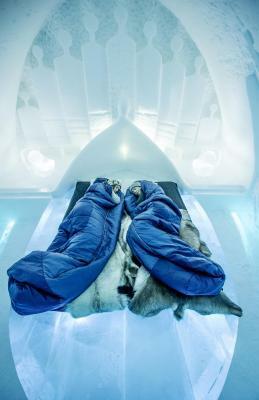 The experience of a lifetime to sleep in an ice bed. 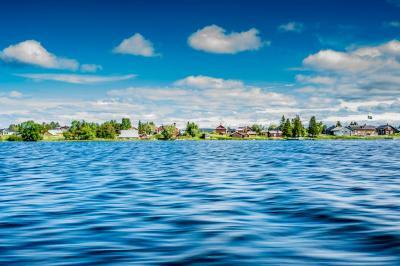 The chance to do snow activities such dog sledding and snow mobile, These were the reasons i chose to stay here. But def pick the warm room if you are not use to the cold . You can always visit the ice cold rooms during the day from 12 noon till 6pm which is open to public. They also provide thermal coats boots etc etc for free!! The receptionist was keen to rush us away and it was a real shame that the lounge closed on our second day, leaving us with nowhere to relax with good food and drink. 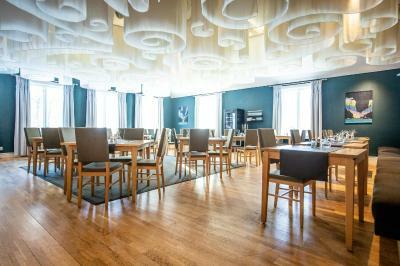 The menu’s at the restaurants (IceHotel & Homestead)could have a separate kid friendly menu. Spaghetti or something. My child and the other child with us ate french fries for dinner every night And that’s it. Also, in the gift shop, all the postcards that had the ice hotel seen on it were all gone I couldn’t send any postcards that looked like snow in the front of the ice hotel they said they ran out along time ago. That was disappointing. Every clothing item then I wanted didn’t have my size so I feel like they sold out and never re-ordered those things because it was end of season possibility. 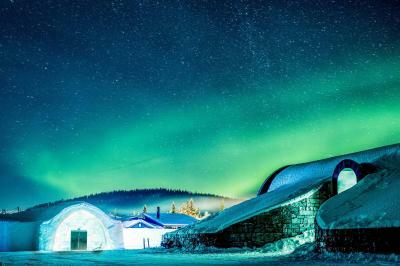 A stay at the Ice hotel is unique, and has to be experienced in one's life. Two things get you awe-struck: one, that one part of the hotel/rooms are rebuilt every year, and two, you get adjusted to the feeling that -5C is actually warm. We had stayed in one of the cabins, as the ice hotel rooms were fully booked. But we had the opportunity to visit each and every room in the non-permanent ice hotel the next morning. The individualistic themes and ice sculptures for each room were a delight, and we spent a couple of hours just rushing through them. The excellent breakfast spread that we had consumed earlier was completely digested just by this sojourn. 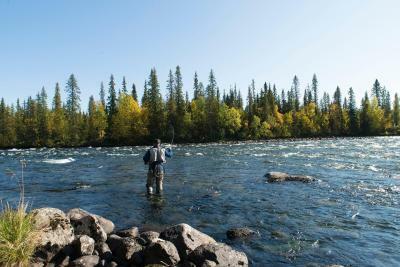 The sight of this river frozen, and being able to walk across, ride a snowmobile, dog sled, or anything that catches one's fancy was unmemorable. Strongly recommend doing this during daylight. Though the staff do indicate that it's possible to view the Aurora Borealis sitting on the river ice, we found that there is a lot of light pollution that prevents from watching of taking good pictures. We drove a few kilometres away and had clear viewing of the same. The staff were very helpful, informative, courteous, and most of all patient in answering every question posed by the hotel guests. 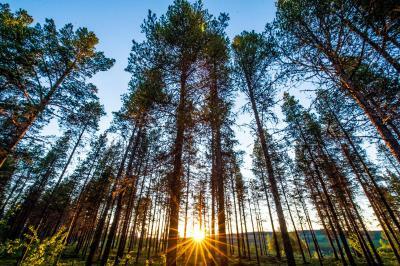 The cabin was very well maintained, clean, and heated properly. The mittens and the boots we borrowed from the hotel for free were absolutely great and necessary for the river walks. Suggest to use the hotel's boots for some of the activities, as it provides the requisite warmth. In summary, I strongly recommend staying at this hotel, once you get over the sticker shock. Good experience in the hotel. 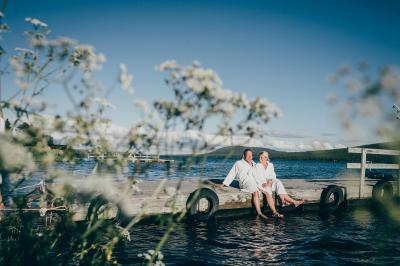 Very romantic place. Think Camp America staff, Holiday Inn rooms and 4 Seasons prices. Not much unfortunately... extremely overpriced for what it is. The cold rooms are fine to stay for a night (although cold) but the warm rooms are extremely disappointing. Staff was extremely disorganized and inept. Long waiting times to check in and extremely long waiting around to be able to enter the room (only from 6pm onwards). We went there as part of our honeymoon - no one even congratulated (in the other places we stayed we got free Champagne, etc.). The room itself was impressive, but extremely cold to sleep in. The sleeping bags were a joke. Overall not worth it - if you want to stay, stay only for one night in a cold room. The warm rooms were ridiculously overpriced. Very spacious room with huge wardrobe. 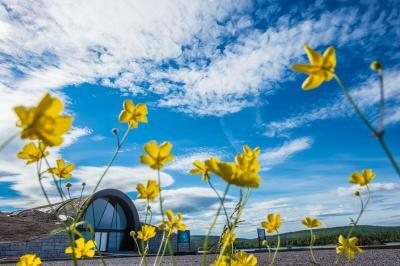 the hotel is away from the city which helps for northern lights visibility. Beds in the cold rooms were very uncomfortable. They were almost too hard. The sleeping bags were fantastic though! Warm and cozy. The whole experience and it’s so relaxed atmosphere. The staff! Everyone was superhelpful and nice! 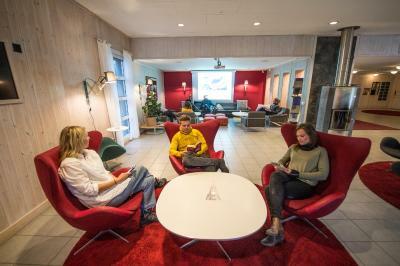 Booking department, reception, activities (snowmobil). Cosy warm cabins to sleep in. Beautiful restaurant for dinner and amazing food for breakfast. Staff were outstanding. The sculptures and Ice rooms are above and beyond my expectations.